The Tap-N-Tee flexible lateral connection accommodates ground movement and has a shear band to prevent off set joints. Tap-N-Tee eliminates the need for glue, epoxy or grout when making a lateral connection and "One Size Fits All." No need for excess inventory and specials tools. The "positive stop" located inside the Tap-N-Tee prohibits protrusion of the lateral pipe into the main line pipe. The Tap-N-Tee provides a smooth transition all the way through to the main line pipe. The JOINTS Tap-N-Tee Pipe to Pipe Connector is designed for 6" inch mainline pipe and larger, minimum wall thickness 1/2", with lateral connection 4", 6" 8." The Tap-N-Tee excepts SMART Certified gold products Clay Pipe and standard bushings / filler rings for Cast Iron, Sch. 35 & Sch. 40 PVC / ABS, AC / Ductile Iron pipes. Tap-N-Tee meet and exceed ASTM 923, ASTM 425, ASTM 1173. 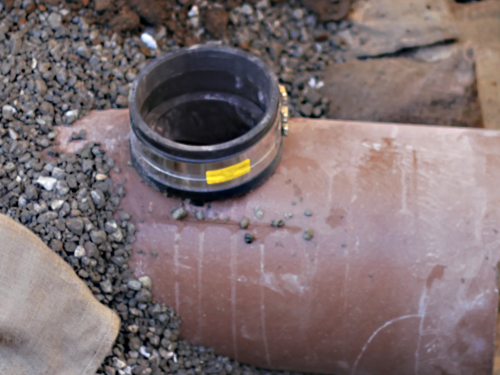 Indexing dimples ensure proper fit alignment visible to video inspection inside the main line pipe. Lateral Connectors manufactured from synthetic rubber. 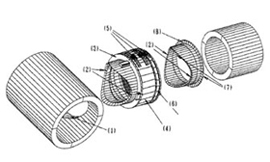 Expansion Ring manufactured from plastic injection ABS. Joints Tap-N-Tees saddle meet or exceed ASTM requirements C923, C1173, C425 and A167. Stainless steel Sheer Bands are available and strongly recommended when resistance to heavy earth loads, shear forces and improved alignments are called for. Type 300 or 316 stainless steel available for Compression Band and Shear Band. Tap-N-Tee fittings accommodate standards bushings/filler rings for the following pipes: Cast Iron, Schedule 35 PL, Schedule 40 PL, Thick Wall Plastic, ABS, Asbestos Cement/Ductile Iron, and Eastern Clay Pipe. Eliminates strapping around pipe. No more waiting for epoxys or concrete to dry. Connector location decided at time of later excavation. Eliminates excavation around pipe and disruption of bedding. Provides economical lateral pipe connection for sewer and drain. Ensures positive, water-tight and rot-free seal. Prevents off-set joints and settlement. Allows for flexibility and durability during earthquakes or ground movement. Prohibits protrusion of lateral pipe into main line. Provides high quality, corrosion resistant components. N-TEE 5.38" 5" 4.25" 5.38" 6.00" # 90 6" 50"
N-TEE 8.00" 7" 6.38" 8.00" 6.75" #136 8" 50"
N-TEE 10.05" 9" 10.00" 8.00" #168 10" 50"